If you're into Northwest wines and you're not familar with the name Ron Bunnell of Bunnell Family Cellars, really you should be ashamed of yourself. Ron is one of the gems of the Washington wine industry and after a stellar career at some huge names like Beringer, Kendall-Jackson and Chateau Ste. Michelle, Ron settled into Eastern Washington and started cranking out some serious small lot Rhone style varietals and blends under his Bunnell Family label. (As an aside the 2006 Bunnell Family Boushey-McPherson Syrah is on my all time wines list.) The second label, made with some of the same vineyard sources, a real focus of Ron's winemaking ethic, is River Aerie. 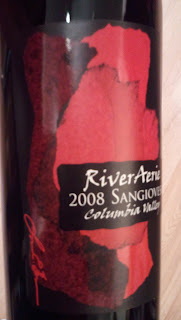 The River Aerie label is named after Ron and his wife Susan's farm beside the Yakima River. The term should not be confused with the term Irie, and or IRIE from the Rastafarian slang. While aerie, or eyrie can refer to a large raptor's nest, Irie is all about having no worries, feeling at ease, I Respect I Eternally. If Irie is the state of mind you're looking for, you really need look no further than the Rivier Aerie label. You're getting a crack at Ron Bunnell's very well made wines at the sub $20 price point and if that doesn't have you thanking Jah, I don't know what will. 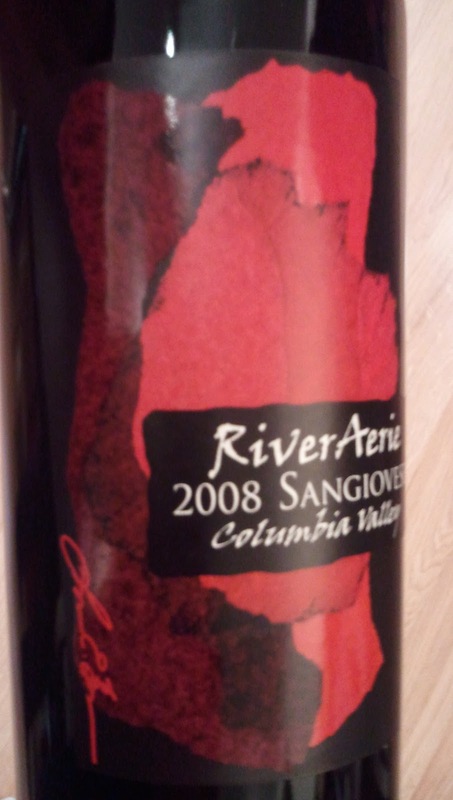 The 2008 Sangiovese is sourced from three Ron Bunnell approved Washington vineyards including two Wahluke Slope sites and the ever revered Boushey Vineyard in the Yakima Valley. The varietally true wine is lighter in body than many Washington's red wines, exhibiting fruit and spice aromatics. The lighter body and brighter acidity make it an easier drinker and great pairing with foods (thank you Italy). I find that Sangiovese can be a gateway wine for bringing novice wine friends over to the "Keep it Real Side." The varietal tends to exhibit fruit and spice in a way that makes it fun and with the lighter body it's never too austere. At $16 and very well distributed pick up this or any of the label's wines and you can't go wrong.